They say that the most important events in English history always occur in years ending in “66”. 1066: The Battle of Hastings. 1666: The Great Fire of London. 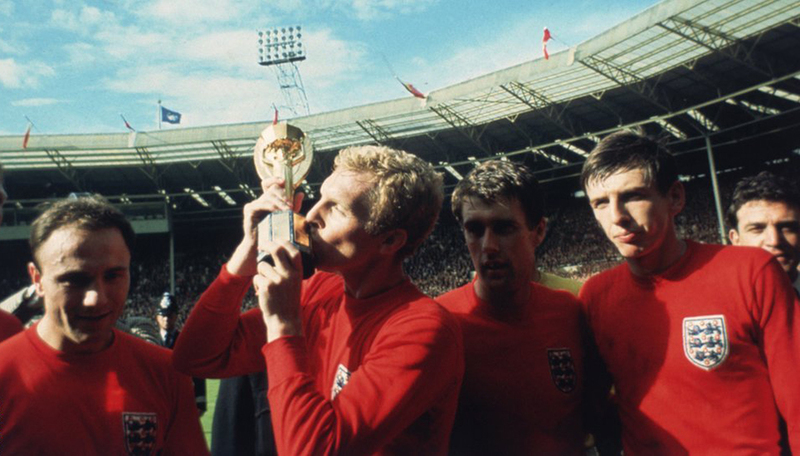 1966: England win the World Cup. 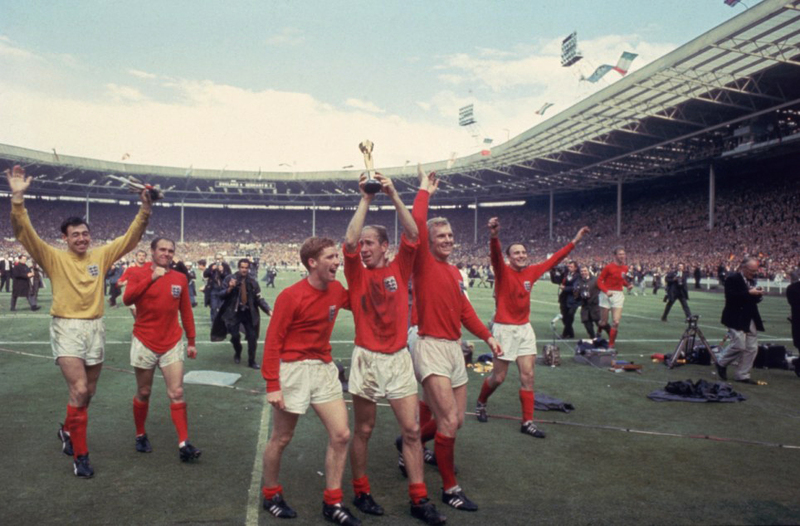 For anyone who is English, or has even spent significant time in England, the year 1966 (or even the number 66 when taken out of context) is inexorably linked with the national team’s sole footballing triumph. Sadly this is an inevitable phenomenon, borne out of the disappointing truth that England has rarely come close to replicating that success in the ensuing half-century. With every failed campaign so 1966 has become deeper ingrained into the nation’s consciousness, to the extent that the cultural and psychological weight of that victory is now far greater than the sporting achievement itself. England had snubbed the World Cup at its inception. Believing their superiority to be without question the FA deemed England’s presence at the first three tournaments unnecessary. When the team did travel to Brazil in 1950, they suffered an unthinkable defeat to the part-timers from the United States. But subsequent back-to-back hammerings at the hands of Hungary in 1953 compelled England’s footballing authorities to reassess its global standing. Nevertheless, encouraging performances in 1958 and 1962 plus home advantage meant that expectations were high in 1966 for the host nation. It was an England side whose qualities were truly English in an old-fashioned sense: class, hard work, personality. Leicester City’s Gordon Banks was in the process of taking over the mantle of best goalkeeper from the Soviet Union’s Lev Yashin. Blond captain Bobby Moore was England’s answer to Franz Beckenbauer: an elegant, modern defender though perhaps not as versatile as his German counterpart. England’s mix of skill and doggedness was exemplified by the balding Charlton brothers, Jack and Bobby. The latter’s darting runs inside from midfield and powerful shots from distance made him virtually impossible to mark. As is often the case in World Cups, fate had a strong hand in the narrative. England’s first choice centre-forward, Tottenham’s Jimmy Greaves, suffered a shin injury in the their final group match against France. His replacement, West Ham’s Geoff Hurst, scored the winner with a glancing header in the quarter-final against a cynical Argentine side (brandished “animals” by Alf Ramsey, who refused to let his players swap shirts with the South Americans). 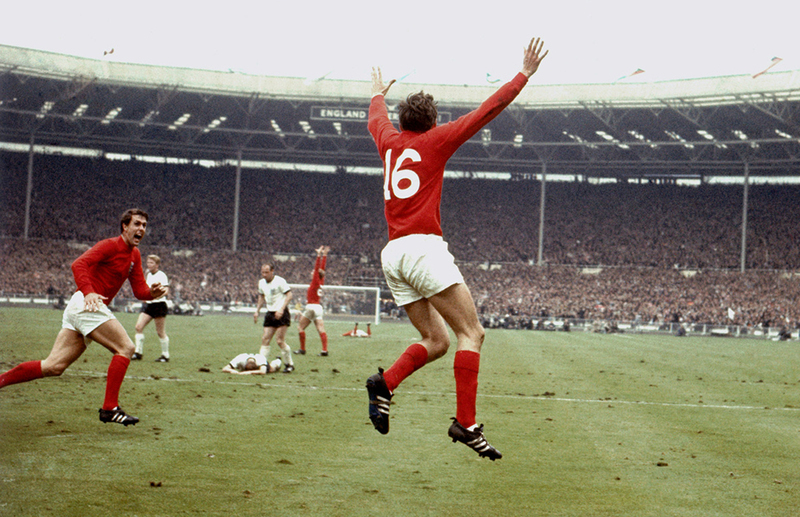 In the semi-final two timely strikes by Bobby Charlton ended the hopes of Eusebio’s Portugal. 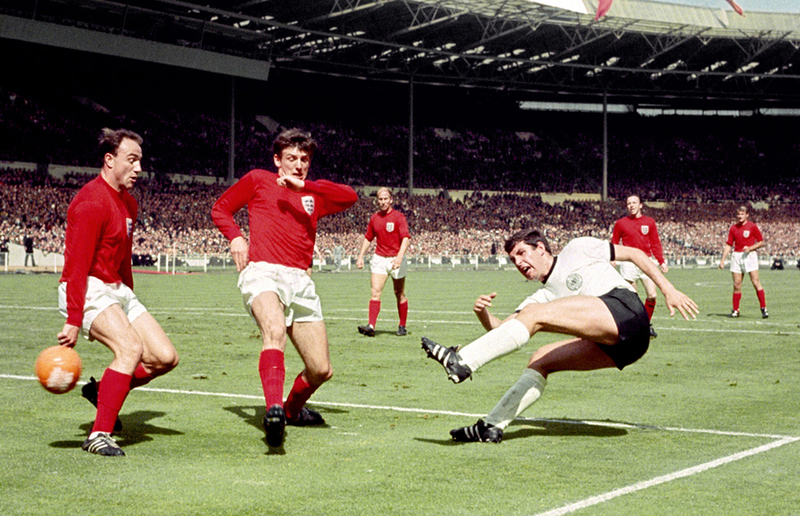 Now all that stood between England and World Cup glory was West Germany. Conditions in London on July 30, 1966 were representative of the English summertime: throughout the 120 minutes the weather seemed to rotate between cloud, rain and sun at quarter-hour intervals. 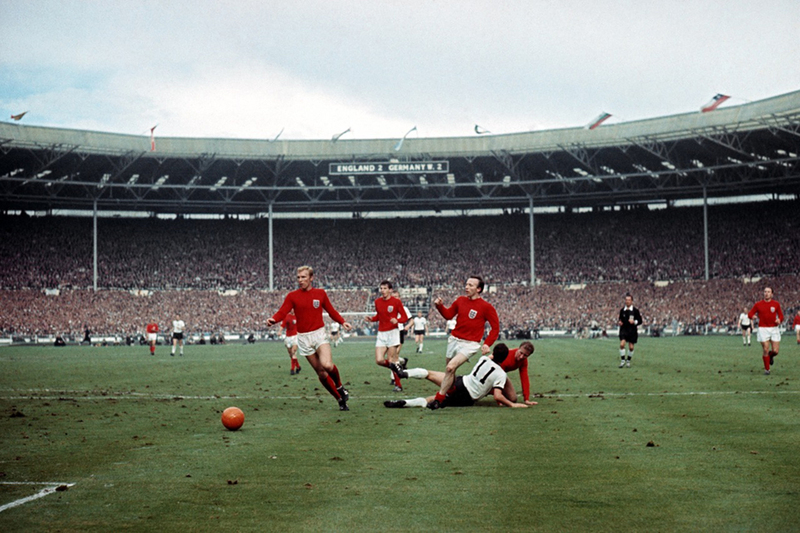 98,000 spectators crammed into Wembley Stadium to see a match soaked through with drama and steeped in subtext. Hurst replied to Haller’s early strike before the third member of the West Ham trio, Martin Peters, pounced on a loose ball to put England 2-1 up. A last gasp equalizer by Weber sent the match into extra-time, during which Alan Ball’s marauding run and cross reached Hurst, whose quick turn and shot hit the crossbar and bounced on the goal-line. Anxious seconds passed before the Soviet linesman validated the goal, which to this day remains perhaps the most controversial in World Cup history. At the time replays proved inconclusive, but endless theories and analysis over the years have suggested England got lucky. 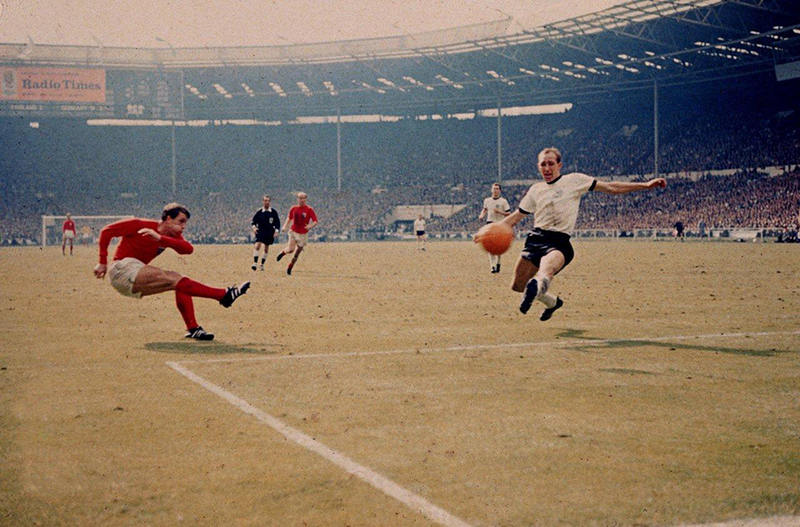 To this day whenever a shot bounces on the goal-line cliché-ridden commentators are always fast to quip, “Ah, shades of ’66…” In Germany, a goal scored in this manner (bouncing on the line after hitting the bar) is commonly known as a “Wembley-Tor” (Wembley Goal). 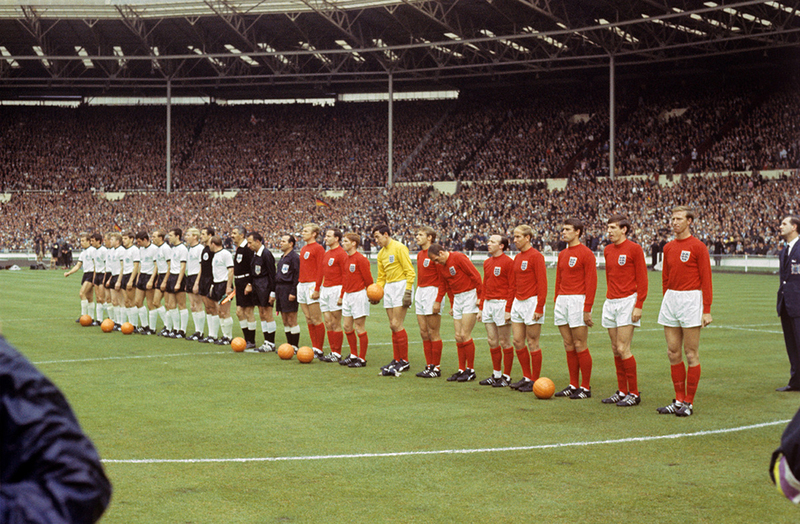 England’s victory over West Germany was made even more memorable by the fact that since both team’s first choice colours were white, the hosts donned a change strip of red shirts and white shorts. Of course, viewers at home saw the match in black-and-white, but photographs and official film of the match have immortalized the occasion in glorious Technicolor. 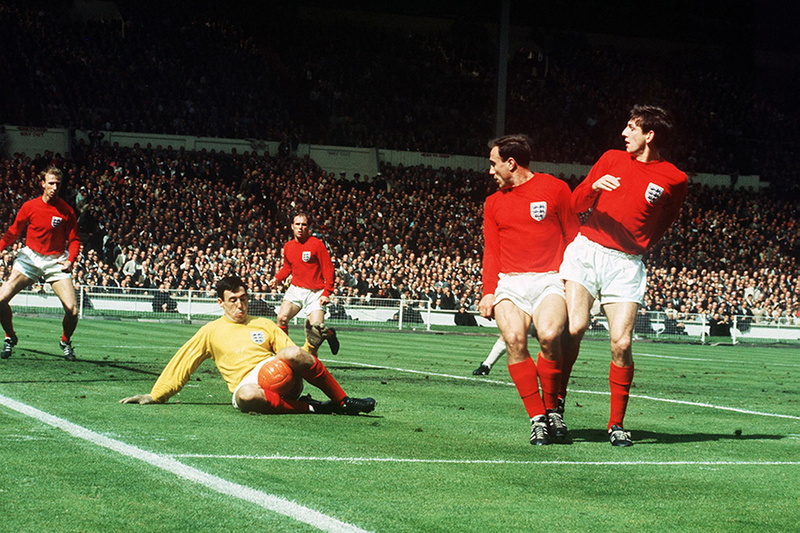 Four years later in the heat of León, Mexico, England wore a lightweight mesh version of their red kit as they faced West Germany again in a quarter-final, though this time the strip didn’t bring the same good fortune. Yet over the years the red shirt has become equally popular with fans as the white home kit. By the early 1990s football in England was undergoing a reappraisal of its history and subculture, and a rapid remarketing of the game soon followed. The shirt you see in these photographs was produced by Arkright (“The Old-Fashioned Football Company”), perhaps the first retro football shirt manufacturer of its kind. 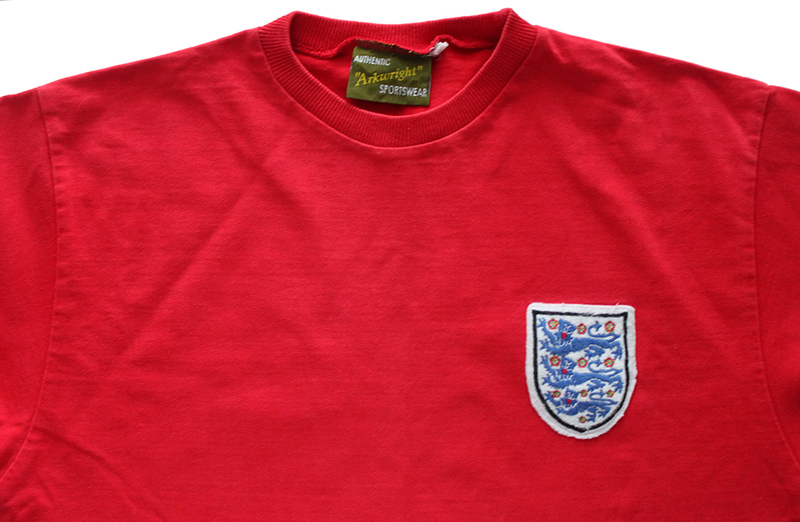 This faithful heavyweight cotton reproduction of England’s red ’66 shirt proved to be its bestseller. In 1993 I wore the shirt to a World Cup qualifier between England and Holland at Wembley. England wore their usual white and the match ended 2-2. I actually met Hurst (still the only man to score three goals in a World Cup final) at a bookstore in 2001 after I’d heard he’d be signing copies of his autobiography, 1966 And All That. He was a thoroughly nice chap, and ribbed me for not buying several copies for my whole family, adding CHEAPSKATE! to his dedication to the Taylors. Today retro football is an industry unto itself, and old school shirts have become popular enough with fans as to directly influence modern football kit design. 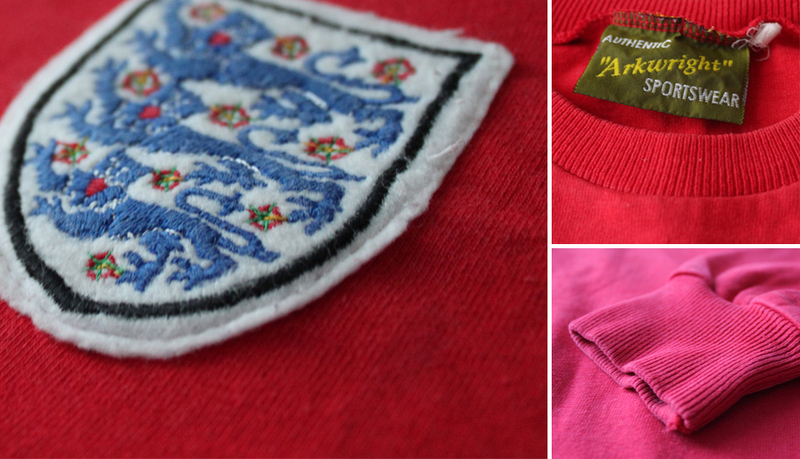 In 2010 England sported a ’66-style red shirt in their second round match at the World Cup in South Africa. Their opponents, yet again, were the Germans. Just before half-time, a Frank Lampard shot bounced down off the crossbar and out again. Replays showed the ball had clearly crossed the goal-line, but this time the referee disallowed the goal. 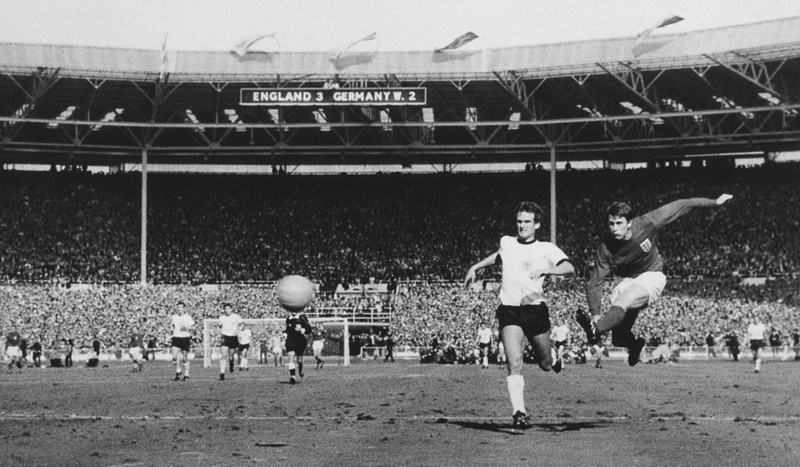 After a forty-four year wait, Germany had got revenge for 1966. Proof that in football as in fashion, what goes around comes around. If you have a spare couple of hours, check out the BBC’s full coverage of the match (complete with Kenneth Wolstenholme’s famous commentary). However, this British Pathé footage is the best I’ve ever seen of the final. Who knew they had HD in 1966?